On Friday morning, January 31st catch Chef Jet on NBC’s “Today Show” in the 9:00 a.m. hour PST. He’s sharing his recipe for Peking Duck Sliders for Chinese New Year and The Big Game! ABC’s “The Chew’s,” Carla Hall, is back with us talking about the very special Culinary Concert she is doing at Zov’s Bistro in Tustin on Sunday, February 9th to benefit the scholarship fund of The James Beard Foundation. “Hootie Hoo”…You’ll meet Sandy D’Amato, a kid from Milwaukee, who grew up to become one of the most outstanding chefs in America. Chef Roger Hayot joins us. You may not know his name but you really should. In the 90s Chef Roger had one of the most acclaimed restaurants in L.A. Now he’s quietly making waves again at a hidden gem of a neighborhood place in Marina del Rey. The first Saturday of last October we were live at South Coast Collection (SoCo) and The Mix in Costa Mesa for the first Patchwork Show: Edible Edition. Food fans know Chef Carla Hall as the “Hootie Hoo” lady and fan favorite from multiple seasons of Bravo’s “Top Chef.” She is now the co-host of ABC’s daytime lifestyle series, “The Chew.” Last month “The Chew” celebrated their 500th episode and the show continues to gain in popularity. Carla also is the author of Cooking with Love: Comfort Food That Hugs You, newly available in paperback. Carla is being honored by Zov Karamardian of Zov’s Bistro in Tustin at her Culinary Concert to benefit the James Beard Foundation on Sunday, February 9th. That Sunday Carla and Zov will conduct a highly entertaining, interactive cooking class for the guests followed by a lavish lunch. Carla will be available to sign copies of her book and interact with the guests. It all starts at Noon. Pastry Chef to the Stars and a multiple James Beard Award-winner, Sherry Yard, is the celebrity MC. Carla is represented in Saveur’s 100 which is the current January/February issue. Item 13 on the list is Carla’s suggestion of Lemon Olive Oil. In 1987 the Authentic Café opened on Beverly Blvd. near CBS’s Television City in the Fairfax District of Los Angeles. It was the inspiration of Chef Roger Hayot who was mentored by his prior employer, David Overton, the creator of The Cheesecake Factory. It was initially a small place and from Day 1 they had lines of patient guests out the door…Eventually they expanded into the space next-door to accommodate the strong demand. Roger’s always intriguing menu was inspired by the cuisines of the American Southwest, Latin America, Asia, and the Mediterranean. He used authentic global ingredients which was unusual at the time. Thai fish sauce was one of his regular ingredients. The exotic appeal of his cooking was always balanced by its hominess. He had the honor of cooking at The James Beard Foundation in New York. There is a new chapter to Chef Roger Hayot’s inspirational cooking story in Los Angeles so we continue. Good Stock: Life on Low Simmer was written by Sanford “Sandy” D’Amato, one of America’s most respected chefs and restaurateurs. It is a special memoir of a life in cooking that weaves more than 80 recipes and both personal and food photos in a beautiful and engaging way. Chef D’Amato tells his life story in brief episodes that are keyed to more than 80 of this James Beard Award-winning chef’s favorite recipes. Sanford, the restaurant D’Amato opened in his native Milwaukee in 1989 (in the space that once housed his grandfather’s grocery store,) has long been one of the highest rated restaurants in America. If you really want to understand what it takes to be a successful, career executive chef this is the book for you. It’s also highly entertaining and a fascinating read. Chef Sandy’s encounters with the legendary Julia Child over the years are priceless. Max Jacobson is a serious food journalist who relocated to Las Vegas from Southern California in 1999 to cover the burgeoning dining scene there. Southern Californians remember his coverage of the Orange County dining scene for The Los Angeles Times. He is currently Vegas Seven’s restaurant critic. His colleagues have great respect for him. Two days before Christmas 2013, Jacobson was struck by a hit-and-run driver while he was in a crosswalk. He sustained severe brain trauma from the accident. He remains hospitalized in serious condition and his prognosis is uncertain. 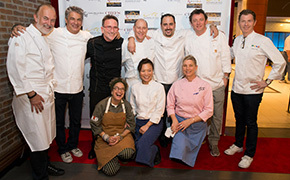 In true hospitality industry fashion a group of prominent, celebrity chefs have joined together to launch the Chefs to the Max fundraising series to assist with Max Jacobson’s horrendous medical expenses. The first dinner was January 19th at Chef Rick Moonen’s Rx Boiler Room at Mandalay Place on the Las Vegas Strip. The evening raised an impressive $275,799. Fellow Las Vegas-based food journalist, Al Mancini, joins us to talk about the Chefs to the Max benefits and working with Max. Al and Max collaborated (with a third Las Vegas-based restaurant writer) on the three editions of the very popular Las Vegas dining guidebook series, Eating Las Vegas. 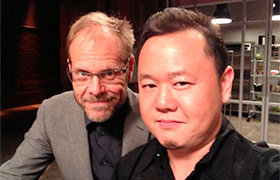 Let’s talk food…Chef Jet and Producer Andy share some of their recent dining adventures.